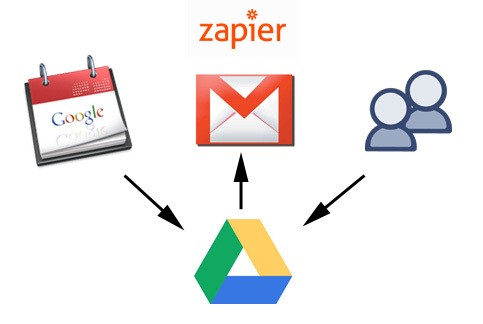 This article is about how to use Zapier in conjunction with Google Drive, Google Contacts, Gmail and Google Calendar to send SMS (text) and/or email reminders for appointments to your clients. I had a fun time making this and wanted to share. Add an appointment to a Google calender. Zapier monitors the calender for appointments that are beginning within 24 hours. When it finds one that matches the criteria, it puts the appointment title and date/time info into a new row on Google Drive Spreadsheet. The Google Drive Spreadsheet uses a script to look up the client in Google Contacts, and grab SMS and email contact info, which it then places on the spreadsheet. Zapier picks up the updated info and sends reminder emails and SMSs through Gmail. I use the SMS@carrier-SMS.com format to send SMSs.